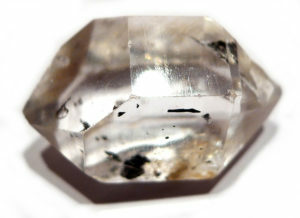 Tibetan Quartz is of stunning clarity and usually contains black inclusions which are most likely carbon. The crystals often exhibit rainbows and are frequently double-terminated. Properties: Tibetan Quartz is purported to contain the wisdom and esoteric knowledge of ancient Tibet. In addition to the qualities of normal clear quartz, Tibetan Quartz has a powerful, focused and detached linear energy, making it excellent for use as a control crystal or wand. However, it is recommended that you have experience with crystal healing before using them in this way, because of the strength of the crystals. Oddly, in spite of this, the energy is feminine, and although there is a Buddha connection, there is also a connection with the Trinity. The double terminated variety seems to distribute energy at the Crown and the Root (Base) Chakras, without touching the Chakras in between.